Indian style deep fried onion fritters. Mixed vegetable fritters fried and delicately spiced (Cauliflower, eggplant, potato, spinach). Crisp turnover filled with mildly spliced potatoes and peas. Crisp turnover filled with curried minced meat. Crisp turnover filled with curried minced chicken. Delicately spiced deep fried chicken fritters. Homemade cheese cubes battered in chickpea flour. Fresh shrimp marinated in exotic spices and batter fried. Fresh fish lightly battered with mild spices. An assortment of Samosa Veg, Cauliflower fritters, Potato fritters, Eggplant Fritters, Spinach fritters. Classic Tomato soup with a simple twist. Fresh coconut simmered in coconut milk soup. Traditional Chinese hot and sour soup with a twist. By popular demand, our classic creamy chicken soup is back. Fresh garden vegetables marinated in fresh ginger & garlic, then cooked with a creamy sauce. Fresh garden vegetables simmered in a spiced gravy sauce. Fresh garden vegetables simmered in a spiced tangy gravy sauce. Spinach and homemade cheese cubes cooked in flavorful spices. Peas and lightly fried homemade cheese cubes, cooked in a mildly spiced sauce. Potatoes cooked in spinach and flavorful spices. Potatoes and cauliflower sauteed in Indian spices. Peas and mushroom sauteed in Indian spices. Chick peas and potatoes cooked in mild spices. Eggplant roasted in the tandoor and cooked with green peas, fresh tomatoes, onions, ginger and garlic, Punjabi style. Chicken breasts, cubed and cooked in a light curried gravy sauce. Chicken breasts, cubed and cooked in a light curried lemon gravy sauce with potatoes. Chicken chunks and mushrooms cooked in a mildly spiced creamy sauce. Chicken marinated in yogurt and cooked in a creamy spicy sauce. Boneless chicken cooked with spinach and mild spices. Boneless pieces of chicken cooked with pineapple chunks and flavored with fresh spices. Boneless pieces of chicken marinated in honey, vinegar and spices, cooked with lentils.Tastes sweet, sour and spicy. Juicy pieces of chicken, prepared with the chef's sharp knife, then simmered in a light sauce with yogurt, onions, tomatoes and mild spices. Pieces of chicken tikka cooked in a creamy sauce with fresh tomato and Eastern spices. Tasty pieces of white meat prepared with fresh bell peppers, slices of tomatoes, spring onions and flavored with spices. Marinated lamb cubes cooked in a gravy sauce. Spiced lamb cooked in a tangy sauce with potatoes. Lamb cooked in spices with fresh spinach. Cubes of lamb marinated in Indian spices, cooked with chopped tomatoes in a creamy sauce. Slices of lamb marinated in cream and cooked in a mildly spiced almond sauce. Hearty appetite will appreciate our specialty from the Khyber Pass region. Diced lamb grilled with Himalayan herbs, tomatoes, and capsicum (Cayenne and bell peppers) in the traditional style. Fresh okra and selected pieces of lamb marinated in herbs and cooked according to our chef secret recipe. A rare delicacy from Northwest India. Juicy lamb pieces specially prepared with the chef's sharp knife, then simmered in a light sauce with yogurt, onions, tomatoes & mild spices. Fresh American chopped lamb marinated in yogurt & a fresh blend of tandoori masala (spices) & cooked with green peas. Lamb marinated in yogurt and cooked in a creamy, spicy sauce. Fresh goat meat cooked in a light gravy sauce. Pieces of goat tikka cooked in a mild sauce with fresh tomato and Indian spices. Mild, medium or hot. tasty pieces of goat prepared with fresh bell peppers, slices of tomatoes, spring onion & flavored with spices. Extra hot spiced goat cooked in a sharp, tangy sauce. Tasty pieces of goat meat prepared with fresh bell peppers, slices of tomatoes, spring onion and flavored with spices. Goat meat cooked with special Indian pickles in a flavorful spicy sauce. Select goat meat cooked in exotic spices with chopped tomatoes and butter. Specialty of Goa, fish prepared with ground coconut and masterfully blended spices. Chefs selection cubed and simmered in a tangy spiced curried sauce with potatoes. Chefs selection cubed and simmered in mildy spiced curried sauce. 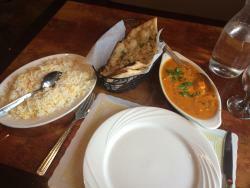 Marinated fish roasted in the Tandoor and simmered in a creamy sauce. Slightly marinated fish, simmered in a spinach sauce. Pieces of fish cubed in a mildly sweet sweet lentil cream sauce. Large shrimp cooked with a spicy coconut sauce. Large and juicy pieces of shrimp prepared with fresh bell peppers, slices of tomatoes, spring-onions and flavored with fresh spices. Large shrimp marinated in honey, vinegar & spices, cooked with lentils, A sweet & sour taste. Shrimp delicately cooked with spinach and mild spices. Tandoori boiled shrimp cooked in a thick tomato and onion sauce. Jumbo shrimp simmered in a traditional lemon sauce with potatoes. Large jumbo shrimp simmered with fresh cut okra in a cream sauce. 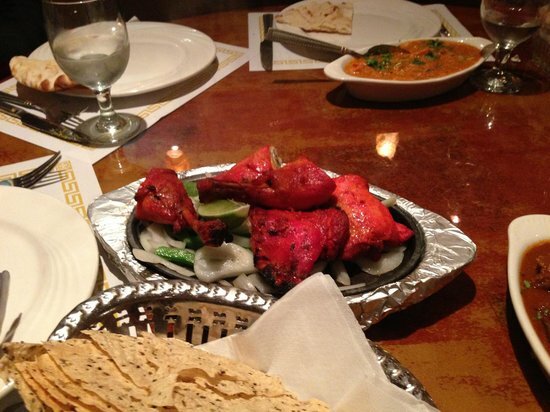 Chicken marinated in yogurt and mild spices, roasted in our tandoor oven. Thick and juicy cubes of chicken roasted in our tandoor oven. Tender pieces of chicken marinated in special spices, barbequed on a skewer in the tandoor and served with rice. Minced chicken mixed with onions and herbs & roasted in tandoor. Minced lamb mixed with onions and herbs & roasted in tandoor. Fresh fish cubes marinated in special recipe, broiled in the tandoor. Large, mouth-watering shrimp, lightly seasoned and slowly broiled over charcoal in the tandoor, served with rice. Dark meat marinated with mangoes and Indian herbs and roast in charcoal oven. Lightly battered cauliflower sautéed in an indo-Chinese sauce. Lightly battered vegetable dumplings sautéed in an indo-Chinese sauce. Marinated Chicken breasts sautéed in Indo-Chinese sauce. Pan seared fish sautéed in Indo-Chinese Sauce. Indo-Chinese angel hair noodles sautéed with vegetables. Indo-Chinese angel hair noodles sautéed with chicken. Chicken breasts cubed and sautéed in a hoison sauce including bell peppers and onions. Chicken breasts cubed and sautéed in a special extra spicy sauce. Basmati rice simmered with a special goan stirfry sauce with vegetables and peanuts. Good service and atmosphere . food was great. Prices were reasonable. Owner came around to tables to ask customers if they were pleased with food and service. Fantastic Indian buffet with some great dishes at a very reasonable price. Often come here on a Friday with some people from work. Get quick answers from Jyoti Indian Restaurant staff and past visitors.